Warren Buffett threw down the gauntlet to Donald Trump again last week. It happened after Trump lied about Buffett’s federal income tax payments on national TV. 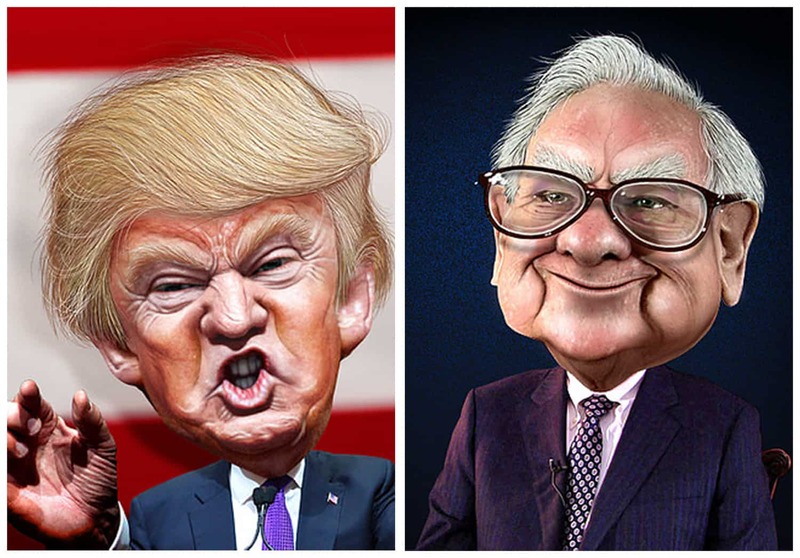 During the second presidential debate on Oct. 9, Trump said Buffett “took a massive deduction,” suggesting it was the kind that the Republican nominee used for years to dodge income taxes. By contrast, Trump’s “charitable” foundation is under investigation for self-dealing, and he is the first presidential candidate in 40 years to refuse to disclose any federal income tax information. In August, Buffett, who is six times richer than Trump, challenged the Republican nominee to a tax throw down. The point of honor in that duel would be revealing their returns. Buffet pointed out that both men are under audit, so that would be no excuse to chicken out. Still, Trump begged off. It’s not enough for a presidential candidate to boast before adoring crowds. It’s crucial that candidates both embody and demonstrate American values. Those standards don’t include lying or shirking taxes or bragging about sexual assault or creating a charity to pay a candidate’s own bills. Buffett demonstrates American values in both words and actions. Trump displays utter obliviousness to those values. Trump claims he’s going to be the law-and-order president. But in the second presidential debate, he admitted he used a nearly $1 billion business loss to avoid paying federal income taxes for years. That means he didn’t contribute to uniforms or cars or guns for FBI agents or offices for federal prosecutors or salaries for federal judges. He’s a $10 billionaire. But he didn’t participate. He didn’t help pay for law and order. Or for veterans’ hospitals or protective gear for military personnel, for that matter. Or border patrols. He’s all bluster, but no action when the dollars count. Trump said “that’s smart,” when confronted with his tax shirking. To mill workers and waitresses and school teachers, whose federal taxes are deducted from every paycheck, it’s not smart. It’s cheating. It’s dishonorable. It’s unethical. Like virtually all wealthy people, Warren Buffett paid less than half the highest marginal rate of 39.6 percent. His was lower because of deductions for charitable contributions and state income taxes. Buffett has said repeatedly, however, that such a low rate for the wealthy is inappropriate. He thinks it should 30 percent, no matter the deductions, for anyone earning more than $5 million. That’s called the Buffett Rule because he has so strongly espoused it. By contrast, Trump wants to lower taxes on the wealthy. Giving any child, as he put it, “a lifetime supply of food stamps just because they came out of the right womb” was harmful and an antisocial act. That is a man who opposes aristocracy. By contrast, Trump would slash the current inheritance tax by more than half, an act that would sustain aristocracy in America, like the one Trump’s own fortune arose from. Buffett started giving his money away in 2006. He pledged most of it to the Bill and Melinda Gates Foundation. Not long afterward, the three billionaires asked other wealthy Americans to pledge at least half of their fortunes to charity. That is an American value: help others pull themselves up by their bootstraps. Donald Trump did not pledge 50 percent of his fortune to charity. In fact, his relationship with charity is truly suspect. His namesake foundation is under investigation. A new report by the New York Daily News raises doubts about whether Trump ever paid the $10,000 he pledged to 9/11 funds. And it took public badgering on Twitter late in May by Washington Post investigative reporter David A. Fahrenthold to get Trump to finally pay to veterans’ groups the $1 million Trump had promised at a Jan. 28 nationally televised fundraiser. Fahrenthold also found that what appears on its face to be Trump’s charitable group, the Donald Trump Foundation, may not really be much of a charity. It gave money improperly to a political candidate, then lied about it on an IRS document. It may have violated laws against self-dealing by using $258,000 in foundation money to settle lawsuits against Trump and to purchase two massive portraits of Trump and a Tim Tebow football helmet. And Trump failed to properly register the foundation after he stopped giving his own money to it in 2008 and used other people’s money to fund it. After Trump boasted during the campaign that he donated millions, the Washington Post made a concerted effort to track down those gifts. It couldn’t find millions. It discovered that between 2006 and May of 2016 Trump gave less than $800,000. That would be less than $80,000 a year. From a guy who claims to be a billionaire. That does not appear to be much of an effort to help Americans who were born with no spoon in their mouths. Buffett urged the wealthy to join him in giving to charity to aid those who drew short straws in life. Donald Trump urged the wealthy to give to his charity to aid his ability to buy portraits of himself. America expects more in its presidents.